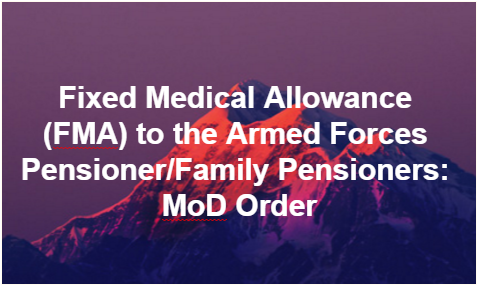 order regarding grant of fixed medical allowances (FMA) to the Armed Forces pensioners/family pensioners in such cases where date if retirement is prior to 1.04.2003 and who had opted not to avail medical facilities at opd of Armed Forces hospitals/mi rooms and are not members of ECHS 29th August 2017 to the Chief of the Army Staff, the Chief of the Naval Staff, the Chief of the Air Staff. Ex-Servicemen who retired on or after 01 Apr 2003 have to-become member of ECHS Compulsorily and are not eligible to draw Fixed Medical Allowance. These orders applicable only in such cases, where the date of retirement is prior to 1.4.2003 and who had opted not to avail medical facilities at OPD of Armed Forces Hospitals/ MI rooms and are not members of ECHS. These orders will take effect from 01.07.2017. All other conditions as laid down in Government of India letter No. 1(1)/98-D(Pen/Sers) dated 15th June 1998 will continue to apply. This issue with the concurrence of Ministry of Defence(Finance/Pension) vide their ID No. 32(9)/2010/Fin/Pen dated 16 August 2017. The undersigned is directed to enhancement of the amount of FMA from Rs. 500/- to Rs. 1000/-per month. The other conditions for grant of FMA shall continue to be in force.